The Disney Soda Fountain is adjacent to El Capitan Theatre (it's the store you exit through after most El Capitan screenings). Special character breakfasts are only offered in conjunction with some 10am shows on weekends and require movie ticket purchase. Breakfast is a flat $25 per person, in addition to the cost of the movie tickets. Doors open at 8:30am. Though it’s an uncharacteristically early start for us (fun fact: did you know the sun is already up at that hour? ), we were rewarded with zero traffic on our way across town. 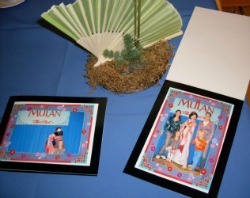 Recent breakfasts have included Jake (of the Neverland Pirates) for Peter Pan, Vanellope from Wreck-It Ralph, Merida from Brave and the adorable Boo for Monsters Inc. For Mulan screenings, the honored guest is none other than Mulan herself. Though she spends the majority of her film in warrior garb, she dons a traditional Chinese gown for breakfast. 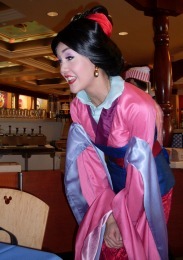 Every table gets one-on-one time with Mulan in the theater lobby. Kids can share private thoughts with her and pose for pictures. An El Capitan photographer captures the moment in commemorative photos that you receive before breakfast is over. (The photos are included in the price of breakfast.) The cast is patient with the little ones, who might get so excited to talk with the princess that they forget to pose for the pictures. Parents are welcome to bring their own cameras to capture extra shots. Some kids come in costume, though by no means all. Many also bring their favorite Disney character dolls. No need to feel limited to the princess of the day; one girl near us brought her Pocahontas doll, and was delighted to discover that Mulan and Pocahontas are great friends. The menu is limited but likely to please most families. 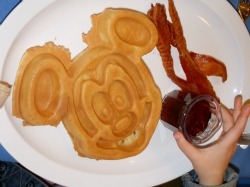 The main course options are eggs, Mickey Mouse waffles, and oatmeal. (Face it, the kids are going for the waffles!) In addition, everyone gets yogurt or fruit, assorted breads, and a side of either sausages or bacon. With a limited menu, people with food allergies or other dietary restrictions are often out of luck. Not so at the Disney Soda Fountain! I called the day before and was told there would be no problem accommodating a gluten-free meal. We were given the options of separately-prepared scrambled eggs or waffles from a gluten-free mix. Our server said they are typically able to accommodate special diets even without advance warning, but to be safe, I advise calling ahead to make sure they can accommodate your particular needs. The Disney cast always goes the extra mile to make your experience a happy one. When one of our party lost a treasured treat in the rafters of the soda fountain, (how that happened is a story for another day), a small but determined band of cast members emerged with ladders, grabbers and tongs, to ensure our tale had a happy ending. The good news is that when breakfast is over, the fun is just beginning, because that's when you head over to watch your movie! Even though we were a few minutes late for breakfast (did I mention it starts at 8:30am?) we still had plenty of time to eat breakfast and explore the studio store, not to mention take potty breaks before our show time. Parking is across the street at Hollywood & Highland, $2 for 4 hours with validation. Even with a little dawdling on the way back to our car, we were still safely within the 4 hour limit. Advance reservations with movie ticket purchase required for character breakfasts. Tickets can be purchased online or by calling 818.845.3110.